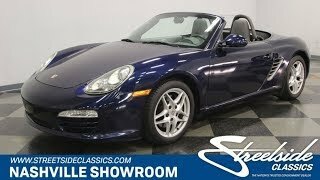 Hi, I am interested in your 2009 Porsche Boxster (stock #1256-NSH) listed on Autotrader for $19,995. I'd like to get more information about this vehicle and confirm its availability. Porsche Boxters are a bunch of fun to drive. You can just zip around town with them, they fit easily in parking spaces, and they have two trunks to stash stuff in. But they are also ready, willing and able to tear up a back road or even enter an autocross on a Sunday afternoon. Come on down and check this one out. Dark Blue metallic along with a fluid shape makes this car pretty stealthy. It looks like the air shaped the curves of the fenders as it flowed up the hood and over the tops of them. Up front an integrated spoiler reaches low for the ground to keep air from getting under the car. The air intakes above it are for the brakes as well as the radiators and the headlights have aerodynamic covers. Body colored mirrors and door handles keep the look clean and the Black convertible top looks great either up or down. Intakes in the rear fenders feed nice cool air to the engine. The rear of the car looks shaped by the air again as it flows together over the fenders and wraps down over the rear bumper. The rear valence has two diffusers drawing air out from under the car with the exhaust tip exiting out the center. Open the door and you will find the comfortable, modern interior that you would expect in a high line sports-luxury car. The door panel is dark gray with accent lines that echo the shape of the car with the power window switches as well as a couple of the speakers for the stereo mounted exactly where they belong. The high back sport seats are trimmed in leather and are comfortable as well as supportive for spirited driving. The steering wheel is sculpted, wrapped in leather, and feels good in your hands. The paddles shifters mean that you never have to take your hands off the wheel to shift it either. A trio of gauges has the tach as the largest and is directly in front of the driver (as it should be) and the speedo as well as engine gauges are off to the sides. The center console holds the FM/CD stereo on the top with the ventilation controls below it as well as the shifter. Under the hood, or actually, hidden under the middle of the car, is a 2.9-liter flat 6-cylinder engine that cranks out 255 horsepower at 6400 RPM. The front hood and rear trunk provide a surprising amount of storage space and there is access to the oil dipstick and fill tube in the rear. Further access to the engine can be had by pulling access panels if you are inclined to do your own work. This engine has already been serviced up recently with fresh oil and filter as well as having a couple oil seals replaced and a new battery. It sends the power back to a 7-speed PDK transmission which gets it to the rear wheels through an independent, multilink suspension. Up front, power rack and pinion steering provides good feel and outstanding handling while big disc brakes at all four corners make sure that you can stop this car in a hurry. 205/50/17s in the front and 235/5017s in the rear are mounted on those beautiful Porsche 5-lug alloys. A power operated top, a comfortable interior with all the luxuries, and plenty of space for your groceries or luggage for a weekend getaway. This car is fun to drive and practical too. Come on down and check it out.